I don't recall offhand if the Lost Empires module has an SSD of a Carn tournament ship or not. I'll have to take a look. 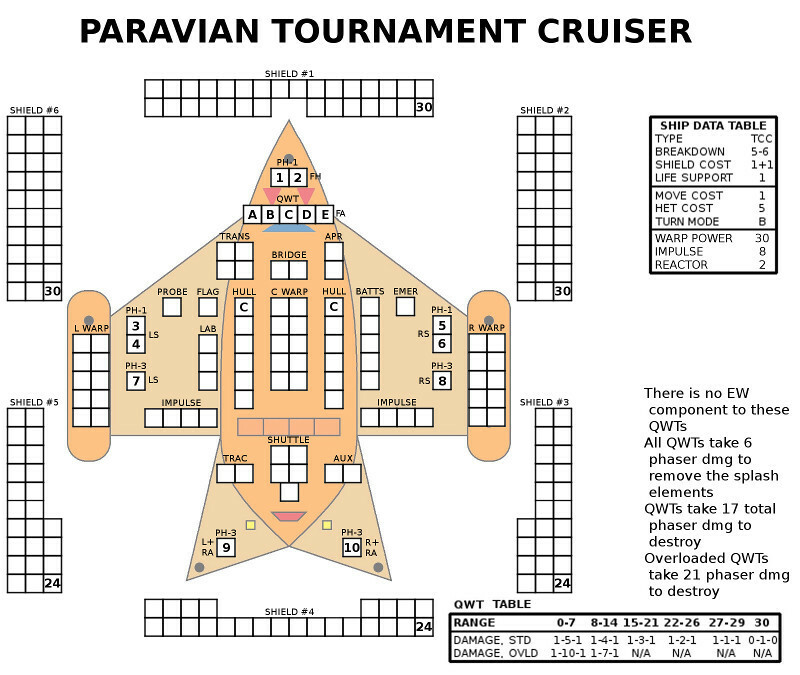 Module C6 does not have any sort of Carnivon or Paravian tournament cruisers. We're stuck making our own. However, I have made such an attempt (post -module-C6), but they post-date J. Gray's TCAs. The Carnivon TCC and The Paravian TCC. Both of these are in SFBOL. Comparing Jeremy's Carnivon against the one I made, some differences are obvious (assuming his HNs, DCs, and DBs use the Mod6 rules.) For one, His is based on a cruiser, while mine is based on the Command Cruiser. Mine has a "cruising speed" (arming standards and going full speed) of 25, while Jeremy's has a cruising speed of 26. In Module C6, the only difference between the CA and CC were a couple of RX PH-2s and a pair of APR. Jeremy's has an extra pair of PH-1s in the front, but is lacking the PH-2s and a PH-3 in the tail that mine has. We both opted for speed-20 DBs, and I have gone the route (which Jeremy is silent on) of claiming that unmodified DBs are all you can use (no special warheads). In addition, I went with "B-Rack" DBs and the extra Deck Crews for the racks, both of which were not something considered when Jeremy did his. I like many/most of Jeremy's SSDs (particularly the Doom series) but have to say that I like your Carn TCC rather than his TCA. Although I like the addition of warp power to any ship, I don't like the mixture he has of APR and AWR. I would rather it be one or the other. And although the addition of a couple of Ph-1's would be helpful, it kinda cookie-cutters the ship a bit. I'd rather stick with the RX ph-2's and 3's for the racial flavor of the ship. The DC's add enough punch to be a viable crunch ship. Although I understand having limits on the DB's (and Maesron Tachyon Missiles) I would like to see various 'packages' that are authorized for the player to chose from at the beginning of a game. Keeps the opponent guessing a bit. I'd also like to see the drone users, especially the Kzinti, also have some additional drone packages that they could chose from just to keep the opponent off balance and on their toes. I like the looks of the Paravian TCC. Some have stated that they think it would get mugged. I'm not so sure. Especially with 5 QWT's that fire every turn. One caveat is that it NEEDS to have true FA firing arcs i.e. fires out of the 6/1/2 shield facings like any other FA firing weapon. That was the designers publically stated intent from the beginning. I don't consider an arbitrary BBS 'ruling' that it only fires out of the #1 as absolute and/or binding. Not to diminish ADB's thoughts on the subject, but they should have consulted the designer before posting. There is no reason that a QWT would only fire out of the #1 and that is a crippling restriction. We fly the Paravians in our FTF group as per the designer's intent. Yeah.. the Paravian will get mugged at some point. It's a matter of how badly it mangles the other guy's shields in the mean time. I have a tactics article for the Paravian that points to the SSD I linked to above. As a side note, the Paravian SSD I posted is using the "Cut Me Own Throat" 3rd Gen artwork. With your own SSD projects, do you think this sort of thing could benefit you? Matt, the SSD linked in your tactics article above, is that the one on SFBOL? Yeah, it's in SFB online. So is the Carnivon SSD I put together, also.